I then asked myself a follow up question: “So what?” Even though I’m a huge fan of Apple products, I never considered myself as a fanboy. 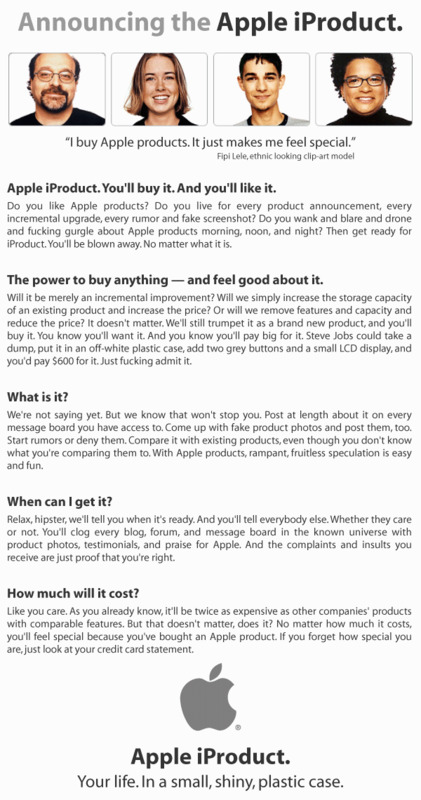 But looking at this spoof which clearly mocks Apple fanboys, I’m guilty of most of the points made above. Apple has a lot of brand power today. The type of brand power that other companies dream to have, regardless how they feel about Apple. The type of brand power that, even a rumored product would stir everyone’s imagination and expectation. I think the biggest contribution from Cupertino is more than its own products. It has created a culture in our society that is highly conscious about both function and form. It forces its competitors to do the same in order to compete. The end result is great for users. It doesn’t matter if they end up buying Apple or something else. People can laugh at Apple fanboys but the reality is — and this is for any company, not just Apple — fanboys and tribes never form around marketing, they form around great products. People don’t *care* about marketing, they only care about the products they use every day, which become a part of their life. The marketing might sell you the product, but it won’t make you love it — that’s up to the product itself. I think it’s absolutely great that there are many Apple fanboys (myself probably included) because it means a company has achieved something truly remarkable: their products are so great that people love them and love to talk about them — even form communities around them.